“Today is graduation day for the Worthington School District and I have a confession to make. I love graduation day. It’s one of my favorite parts about being a school board member. I love the speeches where the Principals recount the accomplishments of the senior class. I love it when the Principals acknowledge those seniors who have chosen to defend our country by enlisting in the armed forces or accepting an appointment to a military academy (and the inevitable standing ovation that follows). I love the amazingly eloquent remarks made by the student class leaders. 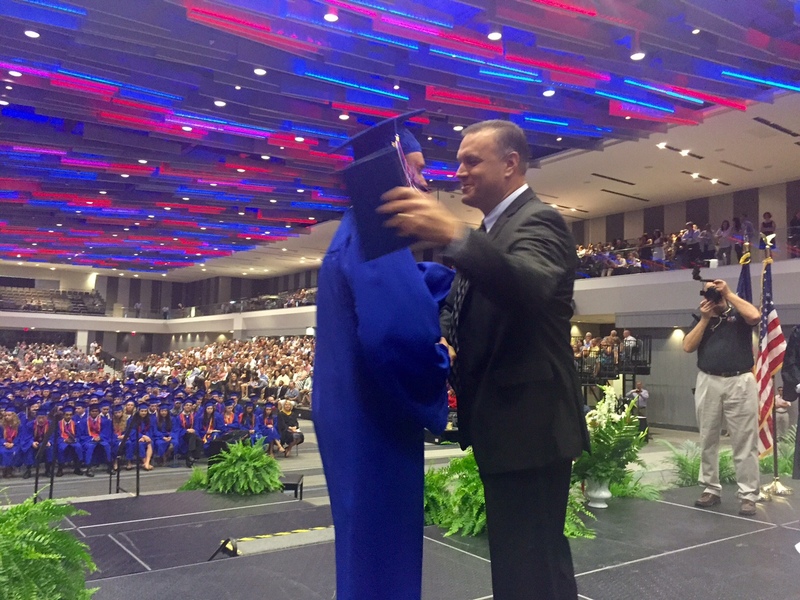 I love the fact that students get to select a special teacher or coach (or bus driver…see the 5/25/15 Columbus Dispatch article) to present them with their diploma because it makes for hundreds of special emotional moments, especially so when that teacher or coach is also a parent. I love the spontaneous outburst from parents when their child’s name is called even though it’s against the rules (really, can you blame them?) and I especially love the fact that the vast majority of Worthington graduates are, at the end of the day, “College or Career Ready” because after all, wasn’t that the point? 2014-2015 has been a great school year in Worthington. Our hope is that the summer of 2015 is a great one for you and your family. Spend some time together, enjoy some lazy days by the pool, at the lake, beach, or in the mountains. Please make sure your student reads everyday. (The Worthington Library Summer Reading Program can help.) We’ll begin the 2015-2016 school year on August 19th. Thomas Worthington High School senior Andrew Craig is locally famous for saying each day “It’s a great day to be a Cardinal!” I’d say it was a great year to be part of Worthington Schools! Thanks for a great school year! The best is yet to come! After much deliberation by the Worthington Educational Foundation Grant Committee, it is with great excitement that I announce the Worthington Educational Foundation (WEF) has selected a winner for their BIG IDEA grant. The WEF will be funding “Words Take Wing,” a wonderful grant submitted by the team of Renee Linn, Ken Pease, Ben Rule, Ken Lease, Margaret Wilcox, Holly Farley, and Carol Price. One of the amazing things about this grant is the established partnerships with other entities. The Worthington Libraries, The Crane Center for Early Childhood Research and Policy at The Ohio State University, as well as Head Start Columbus have all signed on to support this project. In early September of 2014, a group of interested stakeholders from the Worthington education community gathered to begin a conversation about how to create school readiness opportunities for preschoolers from multi-lingual families. Many ELL children are entering Worthington kindergartens at a disadvantage because of their lack of exposure to English vocabulary and literacy activities, including the experiences of being read to and talking about books. This academic lag often continues during the children’s elementary years. There are 250 ELL students in kindergarten through second grade in the district this year and the overall ELL population has increased 10% since the 2013-2014 school year. After focus groups and discussions with Latino families, the partners developed the Words Take Wing project with the goal of increasing the frequency of literacy exposure for ELL pre-k boys and girls through the following: 1) providing training for parents in reading aloud with their children, using specific research-based strategies, and 2) expanding the children’s access to picture books by giving books to the families. The project would benefit pre-k English language learners in the Worthington Schools community. Training would be delivered through 8 learning modules throughout the school year to 30 targeted families. By increasing the children’s vocabulary and literacy exposure prior to kindergarten, we hope the impact will be to decrease the gap that separates the disadvantaged from the advantaged and improve school success for this unique group of children. At this time, please help me congratulate our three semi-finalists: Lori Povisil from the “Students Creating Change” grant, Jon Baird and his team from the “STEM Pathways” grant, and Jacquie Schmittauer with the “Awaker Spaces”. They put in a lot of time and passion, and the WEF wishes they could have funded the semi-finalists, as well. While we are only a few short days from graduation for the class of 2015 and end of year activities are in full swing across the district we’re also already working on the 2015-2016 school year in earnest. Just last week the Board of Education (BOE) and district leaders met for four hours on Thursday and another six hours on Friday. The purpose of the retreat was to go through the community input data, community survey data and administrative and BOE goals and come to consensus on goals for the 2015-2016 school year. One of the the most important messages coming out of our community engagement and the retreat is that people are very happy with the education we are providing for the kids in the community, so change is going to be incremental and whatever we do, there will continue to be lots of opportunity for community engagement as decisions are made. The first goal is to conduct facilities and programming audits. The purpose of the programming audit is to identify exactly where we are in relation to other Central Ohio Districts, should we be offering additional opportunities or, conversely, are we offering opportunities that are no longer needed or desired. The purpose of the facilities audit is to identify useful classroom space and anticipated enrollment patterns. A few of our elementary schools are overcrowded and we have pockets of construction in the district that could exacerbate the problem (e.g. the proposed UMCH development project). We are going to need long term solutions to these problems. In addition, many of our buildings are older and more costly to maintain. We need to determine if some of these buildings become candidates for replacement. The second goal was to update the district’s mission and vision statements with input from all district stakeholders. The district last conducted a visioning exercise about 10 years ago. Since that time, we’ve experienced demographic shifts in the community. The intent of the mission/vision statements would be to serve as a filter for future programming decisions. Maximize academic potential for each student by increasing number of students enrolled in Advanced Placement, International Baccaleurate, College Credit +, and Honors courses; and decrease the number of D’s and F’s that students are receiving. The third goal was to maximize the potential of every student. Essentially, we are looking to stretch the academic boundaries of every student, so that a student would be encouraged to take more advanced classes, more AP classes and so forth, but just as important, a student who has struggled would be similarly encouraged to take and pass classes that challenge their abilities. This will take the combined efforts of our guidance counselors, principals and above all, our teachers to accomplish this goal. Ensure that students graduate without the need for remedial coursework in their college and career plans. The fourth goal was to ensure that Worthington students graduate from high school “College and Career Ready”. To be “College Ready”, one must be remediation free. Throughout Ohio, a significant number of students who graduate have to take remedial courses when they get to college. Worthington’s stats are already very good in this area, but we feel they are not good enough. We want to make sure that every graduate is ready for college when they get there. We will also work to ensure that our students are “Career Ready”. A highlight of the 10-hour goal setting exercise was the no-holds-barred nature of the conversation between the Board of Education and the administration. We do get very high ratings from our constituents, but we can and will do better while continuing to respond to the challenges typical in a changing student population, ever-changing state and federal laws, and changes in society that require adjustments in education. We need to keep innovating and adopting in order to move forward and I’m really proud of our willingness to set goals that will allow that to happen. Like all public school districts across Ohio, Worthington is watching the state budget process very carefully. One important aspect of this process for Worthington residents is how the Tangible Personal Property Tax is treated. On Sunday May 17th The Columbus Dispatch printed an article “Ohio’s phaseout of tax still hitting schools’ finances” on the Tangible Personal Property Tax or TPP and I want to take a moment to provide the information as it pertains to our school district. Tangible Personal Property Tax was a local tax on businesses which represented 11% of our total district valuation in 2005 and each new mill passed since 2005 would have provided almost $200,000 in additional tax revenue. Today this would have provided additional annual revenue of $2.7 million per year for Worthington Schools when we factor in the 2009 and 2012 operating levies that were passed. The elimination of this taxing authority, by a four year phase-out starting in 2006, increased the impact of tax levies on district taxpayers. In 2005 the State of Ohio developed a new tax to replace the TPP. This tax called the Commercial Activity Tax (CAT), is collected on business income and remitted to the state. The state used this revenue to reimburse school districts and other governmental entities for the full amount of losses due to the TPP being taken away. The intent of the change was to increase the State Foundation aid provided to school districts over the course of the past decade in such a way as to replace at least 70% of this loss to the local school district. 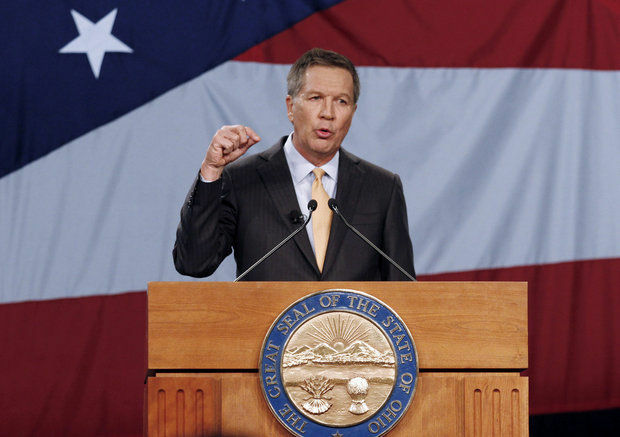 Governor Kasich reduced the reimbursement for Worthington Schools from $15 million annually in fiscal year 2011 to $10.6 million by the end of fiscal year 2013. His current budget proposal will reduce this funding to $0 by fiscal year 2019 while increasing our foundation aid by a total of $4.3 million from 2005. This increase in foundation aid is not even close to a 70% reimbursement for our loss and thus it will further increase the burden of real estate taxes on our homeowners. While we are similarly affected as other districts mentioned in the article Sunday, we have prepared for this scenario and have had it included in our financial planning forecast for a significant period of time. We do not appreciate the state decreasing our revenue nor breaking its promise to increase funding to account for the change in tax policy, but proper planning on our part will avert any dire scenarios as may occur in other districts throughout the state. As a school district we will continue to speak with our representatives and will watch the budget process very carefully. How the state chooses to handle Tangible Personal Property reimbursement will have a significant impact on the budget in Worthington and in many other districts across Ohio. As we enter the home stretch of the 2014-2015 school year it is clear that we ask our teachers to do more now than ever before. Our teachers must make sure that every student in the their classroom grows academically by the expected amount. Using data analytics we measure student growth and by proxy we are able to measure teacher effectiveness. In each of our 19 schools our school staff, often in partnership with our PTA’s and other parent groups, work hard to help school be a place of smiles, laughter and fun. One of my favorite examples of this in action is at Granby Elementary. “The Swamp Things” is the name of the Granby Elementary staff band. That’s right, they formed a band. It started as a fun way to welcome the kids as the buses arrived on the last day of school (Fun Day) in 2013 with a Fun Day song and another instrumental. The band members are fluid. Anyone willing to pick up a cowbell or tambourine is welcome to participate! 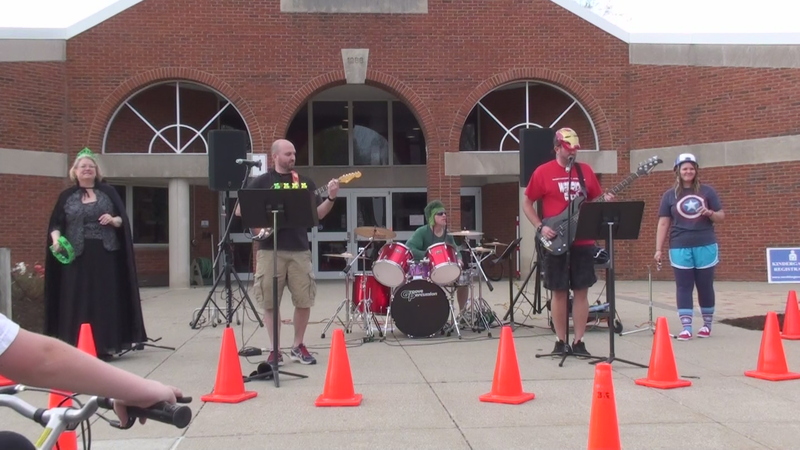 The band I saw perform last weekend at the Bike Fest event consisted of Rick Armstrong (drums), Tyler Hollinger (guitar & vocal) & Parker Norvell (guitar, drums, & vocal), Kate Walker (cowbell & jingle bells), and Principal Patti Schlaegel (tambourine). Now, there is no need to worry about any of them quitting their day jobs. (Once you see the video, you’ll know why…) The kids love it and that’s all that matters! If you’re out and about early, the next concert for “The Swamp Things” will be Thursday, May 28 @ 7:30 A.M. We’ve got a cowbell or washboard tie with your name on it! 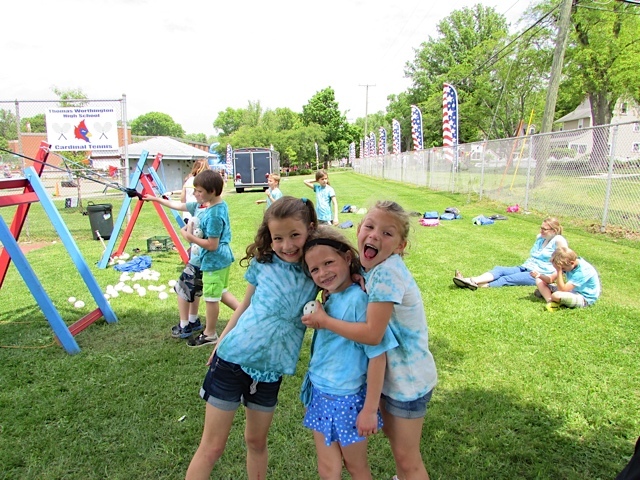 In all of our Worthington Schools over the next few weeks you’ll see hundreds of examples of smiles, laughter and fun. Take a picture and post them on Facebook, Twitter and Instagram. (Or send them to us at dtaylor@wscloud.org) Use the hashtag #wcsfun to remind our community that school is a place of growth, relationship and fun. That’s just the way it should be! May is Mental Health Awareness month. You are more likely to encounter someone- friend, family member, student, neighbor, or member of the community- in an emotional or mental crisis than someone having a heart attack. 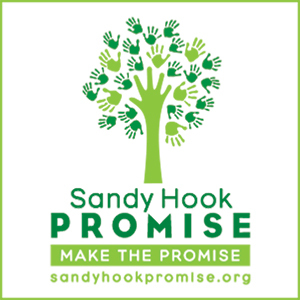 Worthington Schools, Colonial Hills PTA, Partnership for Community and Character and Sandy Hook Promise are partnering to bring to the Worthington Community “Mental Health First Aid” training. Mental Health First Aid™ (MHFA) for youth teaches a 5 step action plan to offer initial help to young people showing signs of a mental illness of in a crisis, and connect them with the appropriate professional, peer, social or self- help care. MHFA is an evidence based research proven 8- hour course that helps identify, understand and respond to signs of mental health illnesses and addictions in youth (age 12-18) and adults. Anyone who works with young people such as parents, caretakers, educators, law enforcement, faith based leaders, college students, coaches and community leaders should attend. Research has shown that MHFA training helps reduce mental health stigmas or the social distance created by negative attitudes and perceptions of individuals with mental illnesses. MHFA teaches about recovery and resiliency- the belief that individuals experiencing these challenges can get better and use their strengths to stay well. When: Saturday, June 13, 2015 8:00 A.M. – 5:00 P.M. Please consider attending this training. Our community deserves it! If you can help just one child it will be WORTH IT! Nothing is more important than the teacher in the classroom! That’s a statement I believe without question. It’s the teacher that works to build a positive relationship with each student. It’s the teacher that creates engaging, personalized lessons that allow all students to grow more than the expected year of growth. It’s the teacher that shapes a diverse group of students into a cohesive functioning unit. It’s the teacher that makes the difference now and long into the future. As an administrator in Worthington Schools, I have a unique perspective into the work ethic, commitment, and professionalism, of Worthington teachers. As a parent in this school district my family has been forever blessed by the teachers who work daily with my children. As a graduate of Worthington Schools my life has literally been changed by Worthington teachers. Teachers make the difference. In my life Bill Wolford was one of those difference makers. Since 1980 Bill has been impacting students at Worthington Hills Elementary in the classroom and on the athletic fields at Worthington High School, and for the past 23 years at Worthington Kilbourne. A young Bill Wolford connected with me unlike any other teacher I had experienced. He took time in the classroom to help me achieve, but he also took time on the playground to teach us lacrosse. 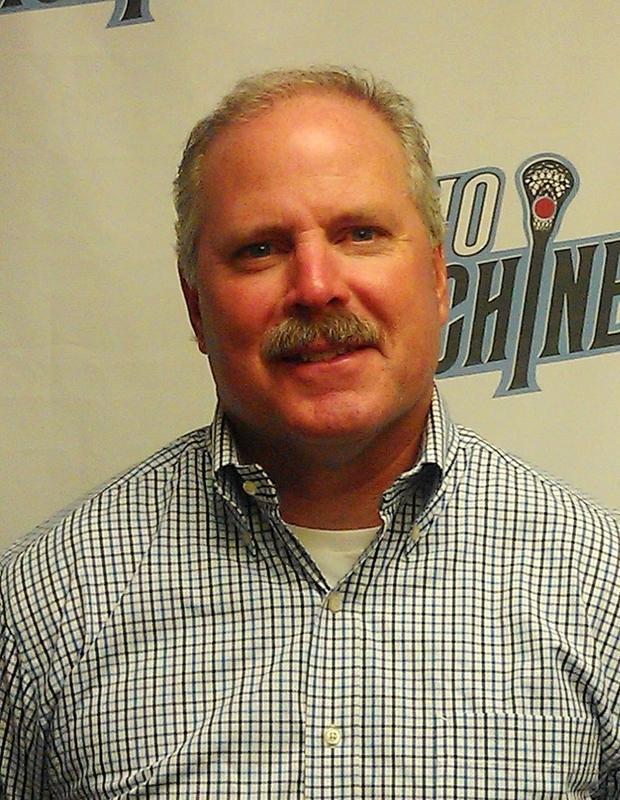 As a young man, I purchased my first lacrosse stick from Bill (a red Brine Superlight 2). I was hooked and that connection would provide me motivation throughout middle and high school to focus to some degree on academics. After graduating from college and becoming a teacher in Worthington, Bill again connected with me and took me under his wing. His role as a teacher and mentor did not end with me in the 80’s, it continued into the late 90’s and early 2000’s. My story with Bill is not unique. Hundred’s and hundred’s of former students and athletes would tell the same story about Bill. A great teacher is not only a great teacher for the school year. Our teachers create a connection with students that lasts a lifetime. This week is teacher appreciation week. I’m thankful for teachers like Bill Wolford and his over 700 colleagues throughout Worthington who work hard everyday to make a positive difference in the lives of Worthington students. Our teachers are not only working to help all of our students become college and career ready. They’re working to help our students become “life ready” with a combination of academic skills, grit, determination and perseverance. Likewise many of our teachers are making a commitment that their guidance, support, and help, doesn’t end when the school year does. It lasts a lifetime. Please take a minute and thank a Worthington teacher this week! They’re worth it. Nothing is more important than the teacher in the classroom!